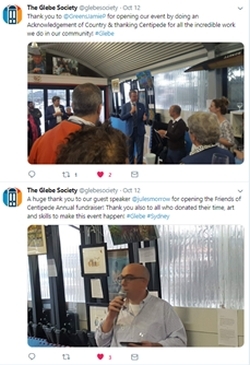 Currently, I am using Twitter to promote Glebe Society events and initiatives; engage people of interest to the Glebe Society and Glebe community; help to build community; promote Glebe-related events and initiatives. 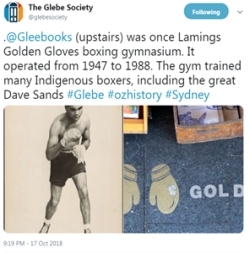 You can follow this link to see the Twitter: https://twitter.com/glebesociety. Most Glebe Society events are shared on Twitter with the aim of increasing attendance. I share a description of the event, a photo and a link to the event registration site. For example, last month the Glebe Society supported the Friends of Centipede Fundraiser. Eight ‘tweets’ were shared over a month to promote the event. At least six people visited the Eventbrite page because of Twitter and at least four people attended the event due to hearing about the event on Twitter, including Jamie Parker. During the event, I shared tweets to show what was happening throughout the evening and to show who was there, demonstrating the event’s success and encouraging attendance at future events. 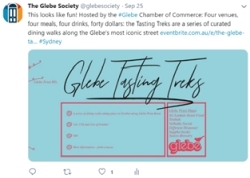 While at the event, high profile attendees (Jamie Parker and Councillor Jess Scully) tweeted about the event, which, in turn, promoted the Glebe Society to their Twitter followers. The Twitter account is used to promote Glebe Society initiatives and website content. This includes ‘Glebe Firsts’, the Elsie Mural, Annual Bird Survey, Glebe Society articles, Glebe Mystery photos, Glebe Walks, Kitchen Starter Pack project and many more. There are so many interesting initiatives and research on the website, sharing them on Twitter is a great way to share them with the Twitter world! 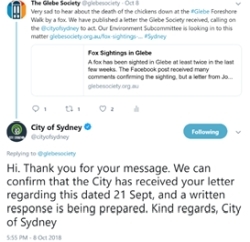 Through tweeting during events and promoting Glebe-related content, various elected officials have engaged with the Glebe Society Twitter, including Councillors Philip Thalis, Jess Scully, Linda Scott and Marghanita da Cruz. This is in addition to Jamie Parker, Verity Firth, Lord Mayor Clover Moore and City of Sydney. Through having a presence on Twitter, these officials are able to stay up-to-date with the great work we’re doing! The Glebe Society shares important non-GS initiatives and events that help build community, protect the environment and heritage. Sharing other organisations’ initiatives and events helps build a community in Glebe as well as positioning the Glebe Society for future collaborations with these organisations. 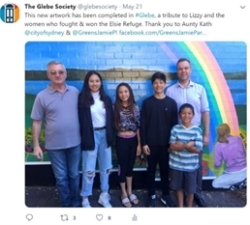 Using Twitter is a great way for the Glebe Society to showcase all the great work we are doing and allows us to connect to new audiences! I find it very satisfying to share all of the wonderful things happening in our community. Feel free to get in touch if you have anything Glebe-related you’d like me to share at twitter@glebesociety.org.au.